Fairly easy meal, but does need at least a half hour in advance in order for the meat to marinade. I used 1 cup of bottled Teriyaki sauce (not the thick kind….consistency was similar to soy sauce). – Heat BBQ to Medium. – Shuck the corn, clean off all the silk. – Spread butter over each cob, and sprinkle on some Kosher salt. 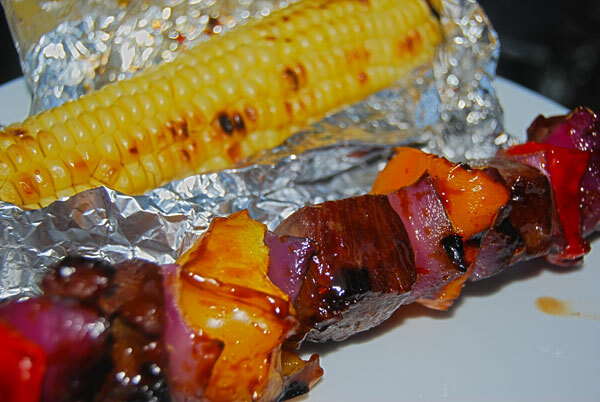 – Wrap each corn cob in foil. Marinade meat chunks in Teriyaki sauce for about 30 minutes prior to adding corn to the BBQ. Dice the peppers and onion into squares that are roughly the size of your meat cubes. 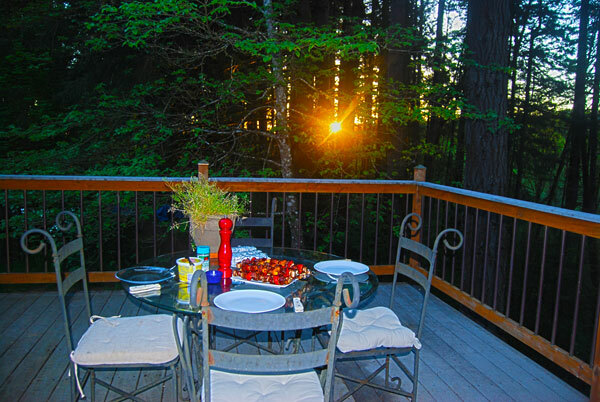 Remove meat from marinade, and pour leftover marinade into a small saucepan, and heat at medium high. We are reducing it to thicken it up a bit (and cook out any raw meat juices !). 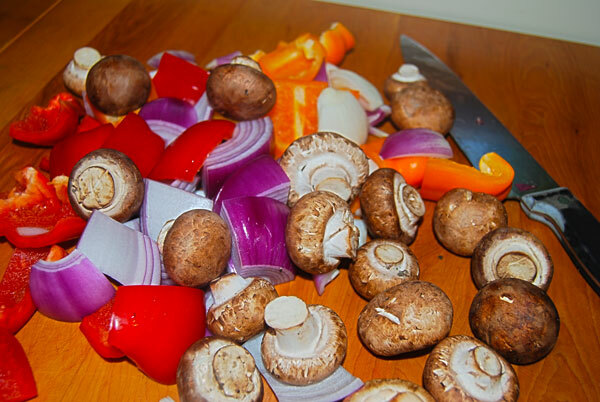 Load up the kabobs…I cap each end with one mushroom, and just alternate peppers, meat, and onions. Flip the corn on the cobs, and move to outer edges of the grill. You can spray/or coat the center of the grill with a wee bit of oil if it looks like it will stick…be careful since it will flame up when you do this. 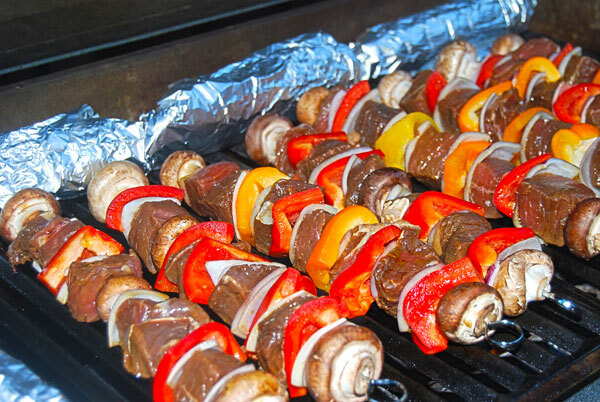 Lay down the kabobs, and close lid…cook for about 4 minutes, then flip and cook for another 3 or 4 minutes. 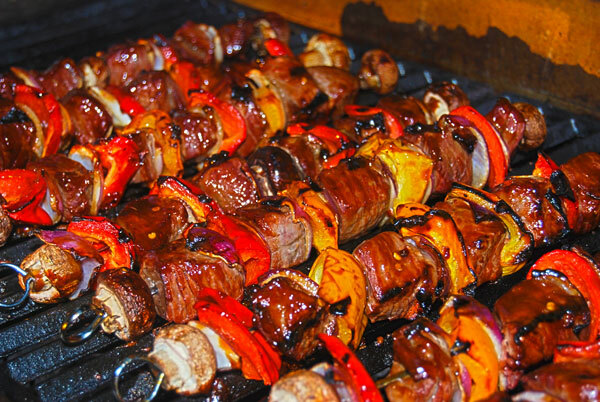 By now your Teriyaki sauce has cooked down nicely, Brush each kabob on both sides with the sauce and grill for another couple of minutes. Thanks Shanna ! It’s definitely a yummy one.